Will eat frozen Mysis & Spirulina enriched Brineshrimp, will take dried foods readily when settled. Appreciates some vegetable matter e.g. dried seaweed. Like many Tangs can be aggressive to newcomers once established. Don't keep with other fish of a similar body shape or colouration, but should mix well with other similar size fish. 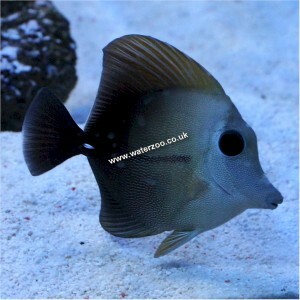 Only keep one Scopas Tang per aquarium, can be kept in a shoal in a large aquarium, if all added at the same time. Tangs of the Zebrasoma family are more resistant to Whitespot than other Tangs. This is a library photo of a 8cm Scopas taken at The WaterZoo, exact appearance may differ due to natural variations and lighting conditions. Our Tangs are hand picked from TMC and rested on our premises for at least 7 days and guaranteed feeding before being offered for sale.